Do you think a keyword-rich, well-optimized blog post is the first step to get the SEO juices flowing through your blog? Think again! Search engine optimization for blogs is not only about content, but site structure as well. Customizing your WordPress settings is the first step to blogging SEO success. Here are a few tips to help you get started . . . Many blogs are accessible by both the http://yourdomain.com and http://www.yourdomain.com. WordPress sets your root domain to http://yourdomain.com by default. There’s nothing wrong with this format, but some search engines have trouble with processing both names for one domain. If you prefer “www” at the beginning, it’s a good idea to change this setting before posting. When someone tries to access your blog with the other domain, the blogging software will activate what’s known as a 302 redirect sending people to the http://www.yourdomain.com web address. Deciding on a single root domain upfront helps maintain link integrity. To add “www” to the root domain, log in to your WordPress account, and go to Settings>General. You will see a field for WordPress address (URL) and Site address (URL). Make sure to add www to both. This will make sure that your default URL contains the www that is more widely accepted and linked with. Ideally, search engines want to see URLs that tell them the meaning of a page. Straight out of the box, WordPress assigns numbers and symbols for post URLs, also known as permalinks. 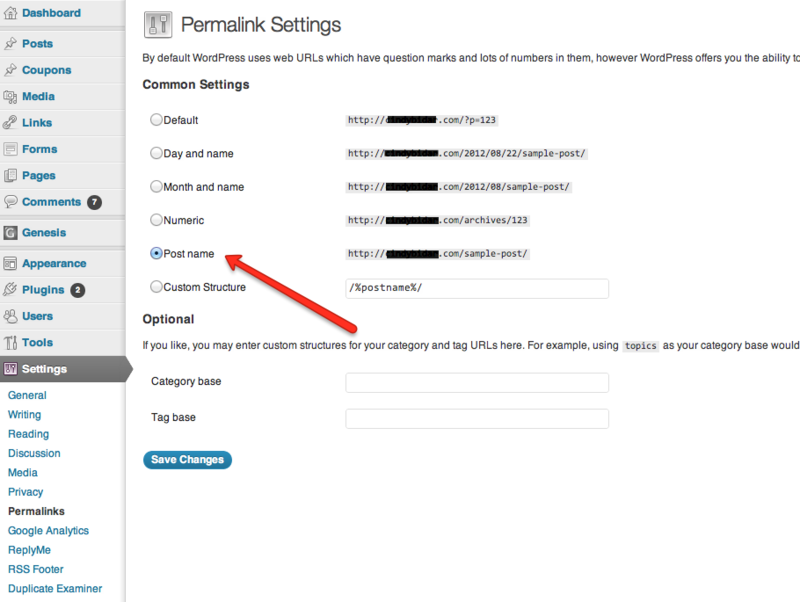 Be sure to customize your blog settings to pull the post titles for permalinks. Not only does this style of URLs guide search engines in returning your posts for the appropriate search queries, but it informs readers of the content to expect by clicking the link. 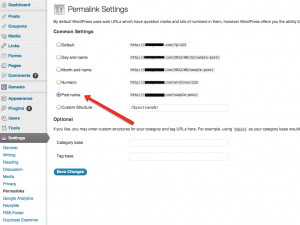 Customize permalinks by navigating to Settings>Permalinks in the WordPress dashboard. To immediately start getting links back to your blog, turn on pingbacks. Pingbacks are a system where every time you publish a link to a blog, the blog is automatically pinged, notifying the owner you’ve linked to them. Often, the blog owners will link to you in return. Pingbacks work really well when you’re linking to related blogs in your niche. You will find the option to activate pingbacks under Settings>Discussions. For default article settings, select both “Attempt to notify blogs” and “Allow link notifications”. By no means are these suggestions a comprehensive list of every area to tweak to improve SEO. The more blogs you set up, the more you’ll learn which WordPress customizations work for specific marketing goals. Tiny niche sites have a different focus than large authority or branding blogs. What’s important to recognize is that WordPress blogs can be crawled by spiders from the search engines and indexed within hours. A well-thought-out blog setup process will position your blog for SEO success from day one.